Broad Heath Blogs»Class Blogs 18-19»Class 6 Blue Blog 18-19»Mould Alert! ← Year 3’s super parent helpers! Year 6 have conducted an experiment to investigate the growth of micro-organisms. In what conditions would bread mould the fastest? We began with placing three slices of bread in three different areas and observed the changes over two weeks. Two weeks later- A slice of bread in the cool year 6 lean-to area. Two weeks later-A slice of bread inside 6 White’s class. Two week later-A slice of bread under 6 Red’s sink area, near the boiler. In what condition did the least amount of mould develop? Explain why. In which condition did the most amount of mould develop? Explain why. To conclude, how would you prevent mould from developing on your bread and food at home? This entry was posted in Class 6 Blue Blog 18-19, Class 6 Red Blog 18-19, Class 6 White Blog 18-19. Bookmark the permalink. 1) My prediction was that the bread under the sink was going to mould faster than the bread anywhere else. 2)The changes were that the bread under the sink was soft and mouldy whereas the bread behind the bookcase was hard and bent but had no mould. 3)The least amount of mould developed in the conservatory because it wasn’t wet or dark in the conservatory. 4)The bread under the sink was the most mouldy because it was dark and damp. 5)To prevent mould growing on my food at home I would keep it in dry and bright conditions but not to bright. 1)I think that the bread would get more mouldy if it was near the boiler because it is a boiling place.Mould also grows faster in a dark places.Mould prefers warmth and grow faster in warm conditions. 2)When year 6 red put their bread under the sink it went really mouldy really fast.It was most affective because it was a dark place. It went all green and blue colour. 3)Under the boiler was most mouldy because it was dark and boiling. 1)my prediction is the bread near the boiler would Mould the fastest because it is in a dark area. 2)I think it would be hard and it would smell bad. My prediction was was correct therefore the investigation went well for me The best condition was the near the boiler because near the boiler is always warm which is a good place for mould to grow in also it is always dark and no one opens the boiler so it is a perfect place to put the bread for our investigation. And the one in 6 Reds class sink has some because people use the hot water. It was in 6 Whites class because it had no sunlight and it dose not have a lot of windows. I would put it in the fridge because in the fridge it is cool and it has no sunlight. 1) In what conditions would bread Mould faster? Within the experiment, my prediction was you have to keep the bread in a hot place to ensure the Mould to grow rapidly, I know that Mould will spread in hot places because the bread will be exposed to the heat. Even though there was some Mould on the bread, the condition the least amount of Mould developed was in the dark cupboard because there was no sunlight, the temperature was cool and the cupboard was shut, trapping any heat to enter. The condition where the most amount of Mould was near the boiler under the sink and the boiler is quite hot, which resulted in Mould to develop rapidly. My prediction was right! To prevent Mould from developing on my bread or food at home, I would ensure I keep my food in the freezer as the cold temperature prevents the bread or food to become mouldy or exposed by heat and I would ensure I keep my food away from moist environments, read and abide by expiry date and avoid putting food near sunlight or heat. 1.My prediction was that the bread in 6white was going to get the most Mould because it doesn’t get a lot of light and Mould likes to grow in dark places . The next two weeks the breads were still fresh but turned a little bit blue. The next time we checked two of the breads turned mouldy but the bread in lean two didn’t have any Mould. 3.in the lean two the bread had the least Mould. 4. In 6white the most Mould appeared beacause 6white was the most warmest class. 5. Keep your food in a tight air space and throw away your bread if they go mouldy . 1)My prediction was that the mould would grow in a place where it is moist and warm.And if the bread was in a cold area it would not be mouldy at all. 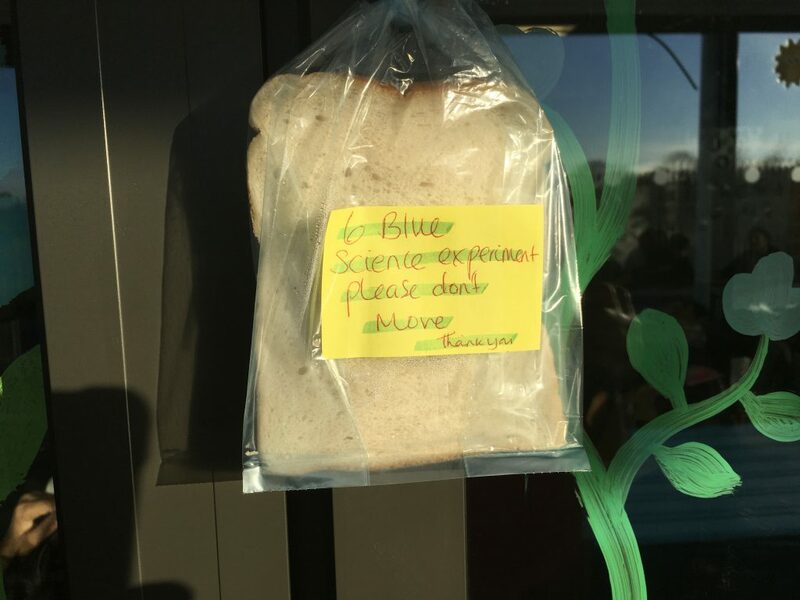 2)The changes were that the bread was soft and smooth first and then slowly it grew green and blue mould.This is because there is lots of sunlight. 3)In the conservatory it stayed cool and no mould grew on it.The reason why is because it was cold as if it was in a fridge. 4)The area the mould grew the most was near the boiler because it was really warm there and moist there. 5)I would make sure that I put bread in the fridge where the mould will not grow and it will stay cool and fresh. 1)My prediction was that the slice of bread in the lean to would have the most Mould as it would be exposed sunlight and heat.Therefore I believed that it would be tha most mouldiest however I was wrong. 2)I observed that the one in 6whites class had gone completely stale and was very hard however the one behind the boiler was not all hard. However the one in the lean to had no Mould on it at all and was perfectly fine. 3) In the lean to it was the least mouldiest as even though it had light it was quite cold. 4) I think that in 6whites class it got the mouldiest. 5) I would keep it somewhere there was no sunlight or you should make sure you have no air and it’s in a air tight space. 1)My prediction was that the bread under the boiler would mould quicker than any other bread because the bread was exposed to heat and it was in a dark place. 1)My prediction was that the bread in the lean to would get mouldly the quickest because it is exposed to sunlight. 2)The changes that I observed over the last 2 weeks were that the bread in six white was very mouldy because the windows and doors were closed and the classroom were spacious.The reason why the bread under the boiler was mouldy because it was dark. 3)The bread that was in the lean to was not mouldy because the weather was cold and rainy. 4) The bread in the boiler was mouldy because it was in a damp and moist condition. 5)I can prevent mould from growing on my food by keeping it away from sunlight and heat. You should keep it in an air tight space. 1)My prediction was that the mould would grow faster in dark and in warm condition. 2)I observed that the bread over the few weeks got more harder in 6 White’s classroom, under 6 Red’s sink area, near the boiler got a bit stiff and in the 6 Blue’s lean-to area there was no mould. 3)The bread which was in the lean-to area had no mould because there was some sunlight and it was cold. 4)The bread which was in 6 White’s classroom had the most mould because it was warmer and had no windows which made the classroom more darker. 1)I think the damp and hot conditions suit the mould the most because of the condensation that happens in the plastic bag when it is hot. 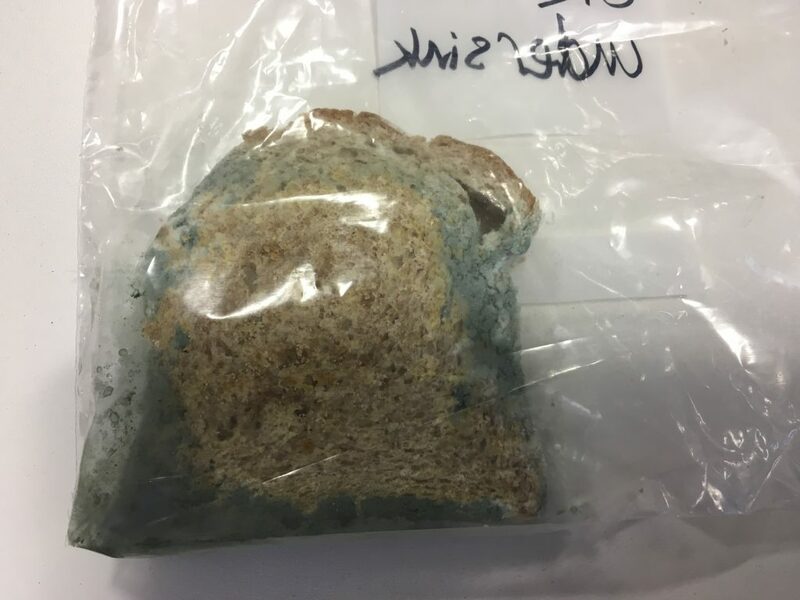 2)I have observed that the bread in the lean to area got hard after the weeks but did not mould on the other hand the other two did mould as the temperature was hot and the heat was condensing inside the bag which caused mould. 3)In the cold and dry conditions the mould did not grow since there was no heat and condensation. 4)In the hot and damp conditions the mould grew the fastest because of the heat and the damp conditions. 5)You need to keep it in cold and dry conditions which stops the bacteria from growing. 1) My prediction was : I thought the bread in the lean-to would produce Mould the fastest because It was exposed to all sorts of weather. My conclusion proved wrong when after 2 weeks, no Mould was produced. I believe this is because Mould grows faster in dark areas with humid temperatures however, days have started becoming colder so it preserved th bread. grow because it is humid and dark. 3) The least amount of Mould grew in our lean to area because it is cold and Mould can’t form. 4) The most Mould grew under the boiler because it’s dark and hot. 5) To prevent Mould, I would keep my bread in the fridge because Mould doesnt grow in cold conditions. 1)My prediction was that it would go mouldy under the sink. 2)It went hard and in my opinion it really stinks and it looked like Its poison. 3)In six blue lean to area because it is cool. 4)The bread in 6white is mouldy because it’s hot in there. 5)mould on bread in my home will get mouldy near the microwave. 1) My prediction was that the bread in the lean to wouldn’t grow any Mould the one in the class room would also wouldn’t grow any Mould. However the bread in 6 white grew a lot more Mould than my prediction stated so my prediction was incorrect. 2) Within the first couple of weeks, the bread in the class room and boiler became stale but the the bread in the lean to area did not show any signs of changing until around week 3 to 4 when the Mould on the bread in the class room and next to the boiler fully grew quite a large amount of Mould but the bread in the lean to area showed little to none signs of growing any Mould. 3) The condition that showed the least amount of Mould growing was in the lean to area were the temperature a sunlight meant that it retard the Mould from growing due to sun light and low temperatures. 4) The condition that showed the most amount of Mould was 6 white’s classroom. The reason why is because unlike 6 blue and 6 red, 6 white as lesser windows as it’s the middle class meaning the light is little to none. 5) By keeping it in the cool and sun light to prevent the Mould from growing. air would find a way into the room. a dark area and it was warm. 1)Our prediction was that the bread which will be placed in the lean-to will have the most mould as the outside area mostly has sunlight,which most likely causes mould. 2)Over the past few weeks we observed that the the bread that was placed in the cupboard was went really hard as it was very cool and dark in the cupboard. 3)The least mound grew on the bread that was in the cupboard because it was very cool in the cupboard which is most unlikely to grow mould. 4)The bread which cause the most mould was the bread in the class,as in the middle class there is less sunlight,which means the temperature would be warmer,leading the bread to mould. 5)To make sure that mould doesn’t grow on our food at home,we must make sure we place it in a cool environment,read and abide by the ‘ best before’ date,and keep bread in a tight container. 1) What was your prediciton? (In which conditions did you think the mould would grow best in?) I thought it would grow faster in warm conditions. What changes did you observe over the few weeks? (Sight, smell, texture) I could see that a bit of mould was growing on the bread. In what condition did the least amount of mould develop? Explain why. The least amount of mould was in the lean to area because it was the coldest. In which condition did the most amount of mould develop? Explain why. The most amount of mould grew in 6 whites classroom because it was the hottest place. To conclude, how would you prevent mould from developing on your bread and food at home? I would put it in a cool place which is away from sunlight. I would also keep it in an air tight container. I would keep it away from moisture. 1)I predicted that the mould would grow quicker in the lean- to room as it would be damp however due to the weather conditions it was cold and the bread stayed fresh. 2)Over two weeks, I observed that the texture got harder when it was in the lean-to room but softer in the classroom . 3)In the lean-to area the bread didn’t grow any mould because it was cold and mould grows in warm areas. 4)The most effective was the one inside the classroom because it was quite hot and there was hardly any natural sunlight. 5)To prevent mould from growing I keep my bread in a cool area like the fridge . 1)I think the most Mould grow in 6white Class room because it is very green and hot in 6 white. 2)That all of them been in a hot area and 6blues bread has no Mould because it is in a cold area. 3)The area is were cold and wet so that why there is no Mould because it is in a cold area. 4)6White classroom is very hot inside so that’s why it has the most Mould. 5)I would put it in the cooles place in the whole house. 1) I predict that the bread would Mould in warmer conditions. 2)I observed the texture and the sight. 4)The bread near the sink under the boiler had the most Mould because near the boiler is warmer than lean to area. 5)To prevent Mould to grow I would keep the food cool,keep the bread in a tight container,keep food away from most environment,keep food away from heat and sunlight and read and abide by the sell date. My prediction was were the boiler was going to get warmer . I think in the classroom was the bread was getting very hot . I think in the lean to area was the least mould because it was very cold . By being in dark places are puting it near sunlight or a cupboard. It hasent mold yet but it’s very hard and it smelled gross. Number 2 because it was making the bag mouldy and smelled like a dogs poo. Keep bread in an air tight cointainer keep food away from sunlight and heat read the exspiring date. 1)My prediction was that under the sink the Mould would grow faster because there is lots of heat in there and there is no oxygen whereas the bread that we had put in the lean to area it would not get mouldy because it is very cold in there and mould cannot grow in cold and freezing places. 2)When I first saw the bread they were all soft and the smell was normal but 5en a few weeks later the bread in the cupboard had got hard because there was cold breeze in there whereas the one under the sink looked normal put a few weeks later when we had finished the experiment the bread was full with mould and it stank because it had green mould coming out of the 🥖 bread. 3)The least amount where the mould had grown was in the lean to area because it was very cold and there and it couldn’t observe heat so it was very cool in there and couldn’t grow mould. 4)The most amount had developed under the sink because it is very hot in there and it doesn’t push the air in because the doors are closed the reason why it grew because it was too hot in there and the mould had grew faster than the one in the lean to area outside 6 blue. 5)From home I would not put any food or bread in a hot area and make it have more cool and cold areas because if we leave it in a hot area it would grow mould very fast because it cannot take the heat. 1)I think the Mould would grow faster in dark places,damp places,warm places and when it is exposed to other Mould. 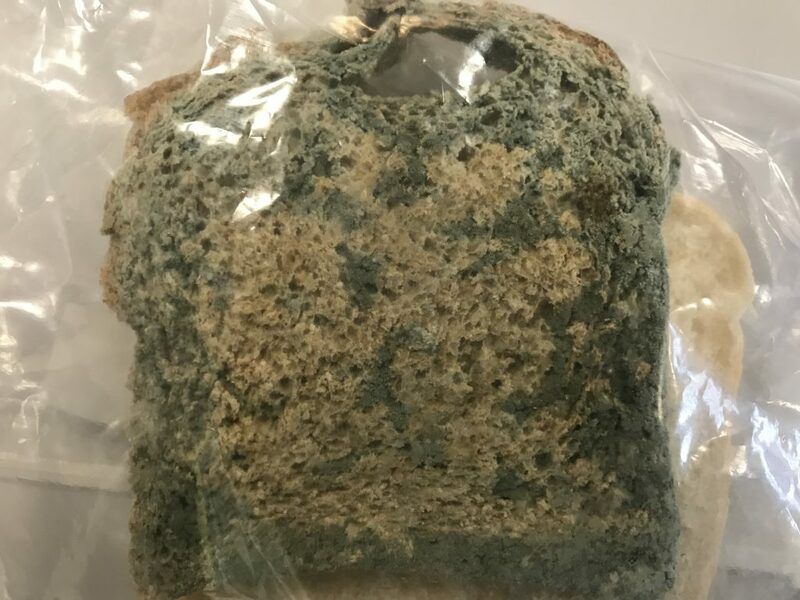 2)I noticed that in the first 2 weeks there was no Mould at all but over the 3rd week I noticed a big change.If you look at the pictures a lot of mould has grown.The mould is all of the green bit.Also,the bread in the lean-too. 3)The least amount of mould grown on a bread was the bread in the Year 6 lean-to, over 3 whole weeks the bread in the lean-to area had no mould at all on it.I think that there was hardly any mould because there was a cool breeze from outside and it reached inside. 4)I think the bread in the boiler,grew the most mould because inside it was dark and it was damp because whenever the boiler was on ,it produced kind of damp water which if the bread was in it which it was it would grow a lot of mould. 5)To prevent the mould from growing on your food at home,I would keep most of the food in my fridge or freezer.Also whenever i go shopping I would check the expiry date so it doesn’t run out that fast and so it doesn’t grow mould. 1) I thought that if we put 6 red bread behind the book case it will mould because spider in there they might have bacteria and they touch it it will get mould. 2)when 6 red put there under the sink it went mould at the side. And the different between 6 reds bread and 6 white breads is that 6 reds bag were open so oxygen were coming in and 6 white bag weren’t open and no oxygen was coming in. I also find out that 6 red room have 2 window and 6 white room have 1 window so in 6 white room is warmer then 6 red room. 1)My prediction was that mould will grow near the boiler. 3)In the year 6 area because it very cold and mould gows in warm places. 4)In 6 White because it was hot if it was cold the mould wouldn’t have grown. 5)Keep your food in a cold place so mould will not grow. 1)My prediction was that mould will grow in a dark and warm place. I thought this because mould grows in dark and warm places. 2)I observed that in week 1 the bread was soft but in week 2 the bread was stiff. 3)The least amount of mould was in the year 6 lean. 4)The most amount of mould was in 6 White. 5)To prevent mould keep your food in a cold place. Well done but you need to explain why mould was found ONLY on the bread in the classroom and not the lean-to area? 1)I predicted that the bread would mould faster in the warmer conditions. 2)The changes I observed were that after 2 weeks the texture of the bread underneath the sink changed dramatically changed. The bread went all mouldy and a green,blue colour. 3)The cool condition was the least effective. I think this because cool conditions are a good place to keep you bread to not mould such as a fridge. 4)The bread under the sink area was the most effective because it’s very warm and dark under the sink and in warm and dark conditions mould grows faster. 5)To prevent mould from growing on my bread at home I will keep it in the fridge and keep the bread away from sunlight or any warm areas in the kichen.